Two members of the English Defence League who planned to do a sponsored walk to Woolwich in south-east London have been arrested. 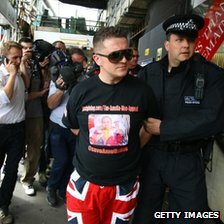 EDL leader Tommy Robinson and Kevin Caroll were arrested outside Aldgate East Tube station in east London. They were later bailed to return to a police station in August. Police had made an order on Friday confining an Armed Forces Day demonstration to an area between Hyde Park Corner and Westminster. The two men planned to pass East London Mosque on their walk from Hyde Park. They were due to walk to Woolwich to lay flowers at the place where soldier Lee Rigby was killed on 22 May. A Met spokesman said: "At approximately 11.25am today, two men were arrested outside Aldgate East station for obstructing police. "They have been taken to a south London police station. Two further men were arrested on suspicion of assault. "They have been taken to an east London police station." In a statement on Friday the Metropolitan Police said conditions were imposed "due to concerns that they may result in serious public disorder and serious disruption to the local community". The organisers of the walk were offered alternative routes to avoid Tower Hamlets borough where the mosque is located but after they declined to agree the order was imposed, police said. The Met said notice under the Public Order Act 1986 imposed a route on the proposed procession of EDL members and supporters starting at Hyde Park Corner and ending at Old Palace Yard. The force said the public assembly could only take place at Old Palace Yard opposite the House of Lords and last for a maximum of two hours.